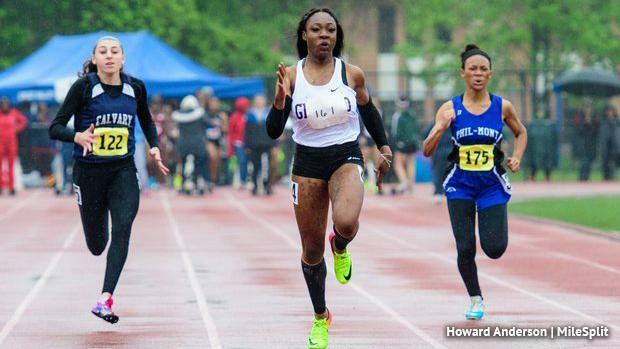 It's one final season for Girard College's Thelma Davies, who has already solidified her spot as the greatest high school sprinter PA has ever seen. Davies will, of course, be the one to beat in AA. She'll be shooting for her fourth straight state title, something she should accomplish barring the unforeseen. She finished off her junior season in a big way, breaking her own 100m state record with an 11.42 at USATF Juniors. She broke her 60m state record indoors and will look for another time drop before heading to LSU in the late summer. There are three other state medalists in AA back from last year. Alexandra Brizzi of Calvary Christian Academy took third at states last season. She went 12.33 in the semis at Ship. A pair of freshman medalists are back for their sophomore seasons: South Park's Maddie Raymond (fifth) and Riverside (7)'s Aubriante Cleckley (sixth). Raymond went 12.18 to win the WPIAL title last year. AAA will once again be a very close battle for the state title. Last year's champ Jonae Cook has graduated, but six total state medalists are back from last season. Hayden Robinson of Avonworth/Northgate is the top returner. She ran 11.92 to win the WPIAL crown last year and placed second to Cook at states. Robinson's older sister Hunter Robinson was a multi-time state champ and now Hayden will look to add her name to the state title list as well. The other returning medalists are North Allegheny's Casey Burton (third), Harry S Truman's Jaleezia Gibson (fourth), Warwick's Lily Palacio-Lewis (fifth), Obama Academy's Raven Haston (sixth), and Warwick's Leah Graybill (eighth). Gibson returns with a time of 11.97. Teammates Graybill and Palacio-Lewis were fourth and fifth, respectively, in the 60 meters at indoor states. Lower Merion's Aja Davis (third at indoor states in the 60) will also be a factor in the 100 meters after a huge indoor season. Watch an interview with Davies at the USATF Junior Outdoor Championships and check out the top 1000 girls returners in the 100 meters below.